This past week I celebrated my first ever Yom HaZikaron and Yom Ha'atzmaut. "Now wait a minute, Simeon," I hear a little voice piping up. "These aren't new holidays. You've celebrated them plenty of times before in America." "But that's just where you're wrong, little voice," I reply. "I haven't." What the little voice doesn't, and can't possibly understand, is that these two days in Israel are nothing like their watered-down American counterparts. In Israel, these days are heartfelt and heavy reminders of all the Jewish people have sacrificed to create an independent homeland and joyous recognition of the fact that, thanks to all this sacrifice, our homeland still exists today. The only way to really feel all this is to be here in Israel. On Yom HaZikaron, Cheryl Mandel, an Alon Shevut resident originally from Canada, spoke to the overseas students at the Yeshiva, telling the story of her son Daniel z"l, who was killed while serving in the Israeli Defense Forces. Afterwards, the Yeshiva attended a Yom HaZikaron remembrance ceremony overlooking the cemetery of Kibbutz Kfar Etzion, the first settlement established in Gush Etzion after the area was liberated in 1967, and the first home of Yeshivat Har Etzion. Also attending were hundreds of other Gush Etzion residents, students from several local schools, and a group of IDF soldiers. The ceremony was short but powerful, with songs sung by school choirs, poems recited by children, and a chapter of Psalms read aloud. An F-16 fly-over and a communal singing of Hatikva ended the formal ceremony, after which many entered the cemetery and visited the graves of soldiers who perished fighting for Israel, including Daniel Mandel. Later that day, the overseas students of the Yeshiva watched a video about Yoni Jesner z"l, the Yeshivat Har Etzion student from Scotland who was killed by a terrorist on a bus in Tel Aviv five years ago. Rosh Hayeshiva Rav Yaakov Medan addressed the entire yeshiva, telling the story of a member of Yeshivat Har Etzion's first class who was killed in the Yom Kippur War, after which Rosh Hayeshiva Harav Aharon Lichtenstein led the Yeshiva in learning mishnayot in his memory. As this day of intense emotion concluded, the entire country switched over to one of intense joy. 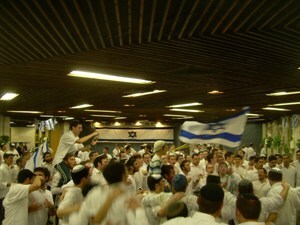 Yom Ha'atzmaut began at yeshiva with a seudat mitzvah and chagiga that lasted well into the night. The next day, students set out on tiyulim to various locations, including hiking up mountains, exploring historical cities, and visiting natural springs. In the afternoon, all the various tiyulim of the yeshiva joined together in a national park in Derom Har Chevron for a massive barbecue. Not to neglect our learning, the day ended back at yeshiva with night seder, followed (with relief by all) by sleep. I can write about what I did, but I can't quite explain to the little voice just what it was I felt. It was a two-day period in which the country reached the depths of sadness and the heights of exultation. There were speeches and barbecues and singing and dancing, but, most importantly, there was a feeling that pervaded all, a feeling of joy and pride to be a Jew in Israel - the home of all Jews.